To what extent does this constitute a meta-conference? It was an organised process of asynchronous dialogue with a remit as wide as the conference itself, with the choice of topics being left to live bloggers as they made their way through the conference. To the extent live bloggers were reading each other and in some cases responding to each other, either directly in a substantive way or indirectly through riffing off themes such as awkwardness or isolation, it is clear the above is more than the sum of its parts. It wasn’t simply individuals responding individually, with the live blog being an aggregate of these individual responses. It wasn’t a collective either but rather something in between the two. What is this in between and what can it tell us about conference sociality and how it can be extended and deepened using social media? Social media has been central to our journal in recent years, helping us build a new relationship with our readers and expand beyond our traditional audience. We enthusiastically embrace it as a means to promote sociological thought, as well as a way to work towards a more engaged and open culture within the academy. But making good on this promise requires that it is treated carefully. For this reason, we have included this document in each delegate pack, offering some principles and guidelines to inform your use of social media at Undisciplining. We have a few non-negotiable requirements, included after careful deliberation within our team, but mostly what we have included are pointers we hope will improve everyone’s social media experience at the conference. Be clear about what you are doing and why. It can be easy to slip into using social media in a habitual way, particularly when you’re waiting for a coffee break. But the more concrete you can be about your aims, the easier it will be to ensure you are using social media effectively. The table below provides an overview of conference social media activities and common reasons why these might be undertaken. It is by no means exhaustive so please don’t worry if you intend to use these platforms in a way we haven’t listed here but please talk to us if you have any doubts about its appropriateness after reading these guidelines. There are possibilities we haven’t listed here, such as live streaming and recording audio-visual material, which we request that you don’t use at the conference for reasons explained below. Remember that people can have different interpretations and will bring different knowledge to the same situation. This might sound obvious but social media can make it hard to remember this by stripping interactions of context and presenting isolated units of communication in a way that is easy to misinterpret. We want people to be critical of the arguments they encounter but please try to be civil and give other conference goers the benefit of the doubt. People have a right to know what you are saying about them so please ensure you tag other users if you are talking about their contributions to the conference. Likewise please ensure you credit people appropriately, including relevant affiliations (most academic departments now have Twitter accounts) if the person in question does not have their own feed. Social media can often magnify disagreements and multiply misunderstandings. 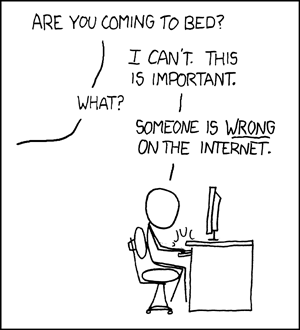 To paraphrase our favourite xkcd cartoon, if it begins to matter to you that someone is wrong on the internet then that’s a sign you should put down your phone or tablet and engage with the conference without social media for a bit. We want to use social media to help people at Undisciplining connect with each other and the last thing we want is for people to spend the event falling out over social media. We’ve worked hard to create a friendly, engaging and welcoming event so please do your best to approach each other with that ethos when you interact through social media. Please ensure you use the #undisciplining hashtag on Twitter and Instagram. This will allow us to keep track of what’s happening on social media and curate this material before, during and after the event. We are keen to help people connect with each other and connect to other conference goers, so if you’d like us to recirculate something to other participants at the conference please tweet the request to us or e-mail community@thesociologicalreview.com. Please follow the instructions of chairs concerning social media. While we encourage social media at the conference as a whole, speakers and organisers establish what they are comfortable with in their sessions. Therefore please listen to the guidance of the chairs and respect any concerns or requests made by speakers to this end. Please refrain from using live streaming services like Periscope or Facebook Live during the conference. Many people are uncomfortable with the idea of being live-streamed and its immediacy can create problems, even for those who might be comfortable with the idea in principle. Please refrain from recording audio or video at the conference. We have put a lot of time and energy into planning the multimedia being produced at the event. We want to ensure that we capture the event in the most effective way and ensure everyone is comfortable with the finished outputs. Please be considerate in your use of photography at the conference. Photography is ok in the main auditorium unless otherwise specified. Please aim for crowds and avoid foregrounding individuals when taking photography outside of sessions. Avoid photography in workshops unless told it is ok. If in doubt about something, please ask at any point. Tweet or DM us @thesocreview, e-mail our Digital Engagement Fellow directly at community@thesociologicalreview.com or speak to one of the conference team who can direct your query accordingly. Thanks to the many people on Twitter I talked to directly and indirectly about these while planning them. Begin the live tweeting by introducing the speaker, with a photo and tagging them on Twitter if applicable, using the hashtag e.g. “Full room for tonight’s #imagine2027 with @speaker, talking on how we can have a more equal society by 2027”. If the speaker is on Twitter, try and tag them as you live tweet but be careful not to start a tweet with their twitter handle. This has to be in main body of the tweet rather than at the start to ensure the message is visible to the full list of followers. Try and convey the gist of the speaker’s argument rather than capturing every detail of what they’re saying. Listen out for powerful phrases the speaker uses and tweet these as quotes e.g. “Important message from @speaker at #imagine2027: “powerful phrases they used”. Look through the hashtag #imagine2027 and retweet audience members throughout the talk. Don’t quote particular audience members when it comes to the Q&A but it’s fine to summarise the topics which are coming up in questions. Close the session with a tweet thanking the speaker and the audience.